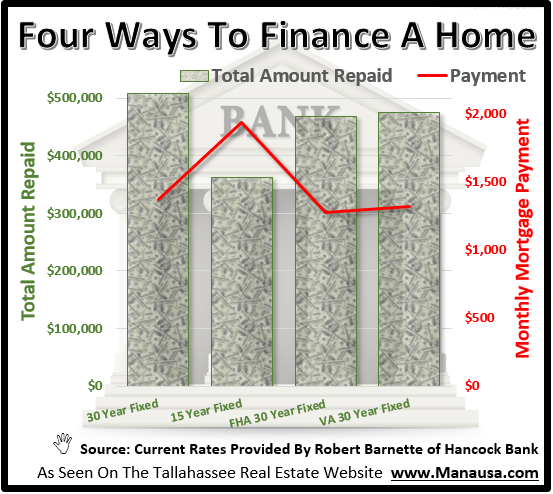 With mortgage interest rates so low, many of the people buying a home in Tallahassee are wondering whether they should go with a 15 year mortgage or the more traditional 30 year fixed rate mortgage loan. The answer to the question will be unique to each person, but I have put together a methodology that will help you work through the problem yourself. It might seem a little complicated for people who haven't amortized a few thousand mortgage loans before, but hang in there, I think the logic will shine through. + Low Interest Rate - One of the lowest mortgage rates you will be offered by a lender will be for a 15 year, fixed rate loan. Why? Because the lender gets a little extra security with a shorter term loan. They get their money back quicker, and borrower equity grows faster, meaning the lender has less money at risk. + Paid Off Sooner - Instead of making payments on your house over the next thirty years, this loan will be fully repaid at the end of 15 years. Think of it as a forced-savings plan, being able to live "rent free" after 15 short years. - Higher Monthly Payment - Of course, the reason it will be paid off sooner is because you'll be making a larger monthly payment (larger than you would with a 30 year loan). I recommend that all buyers consider a loan that will give them a faster payoff (because of a slightly higher monthly payment), but without having to commit to the larger payment every month. So what I'm talking about is a thirty year loan, but with a plan to make payments at the same monthly rate as a 15 year fixed rate mortgage. Ultimately, you don't get the lower interest rate that the fifteen year loan would deliver, but you also do not have to make the larger monthly payment if you find yourself a little strapped for cash at some point in the future. The vertical columns of cash, measured on the left vertical axis, show the total amount of money that will be repaid to the lender. 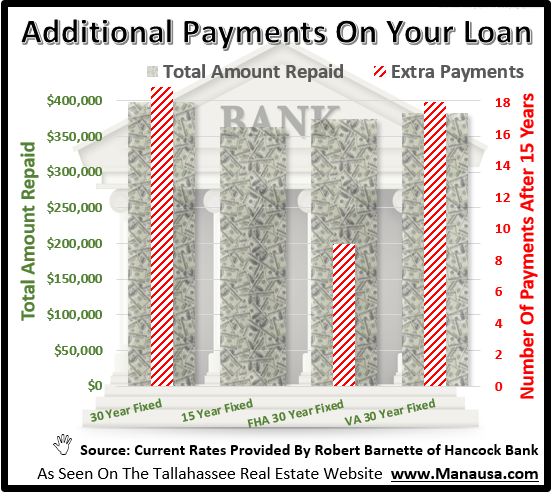 The 15 year loan shows the lowest amount of repayment. The red line shows the monthly mortgage payment for each loan, measured on the right vertical axis. 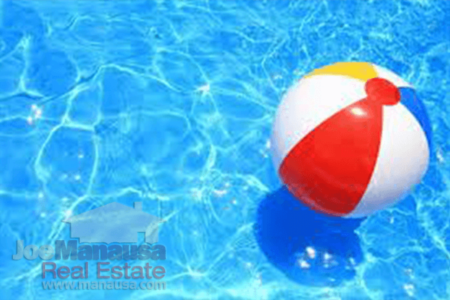 The lowest payment comes from the FHA 30 Year Fixed Rate Loan, while the highest is from the 15 year loan. So what would it look like if we applied the payment of the 15 year loan, to all three other loans? This would mean that the borrower would pay more than what he committed to pay, thus the amortization period would end up being shorter than 30 years. The following graph shows the total amount repaid by the borrower for each loan type, as well as the number of extra payments (beyond the 15 year loan) needed to be made to satisfy the debt. The graph shows that the smartest options are either the 15 year loan, or the FHA 30 year loan. The upside of the 15 year loan is a lower interest rate which results in a payoff that occurs nine months faster than the 30 year loan, and a total repayment amount that is 3.2% less money than the the longer loan. But the downside is that the borrower is committed to the higher monthly payment, thus putting the borrower in a potentially riskier position if future cash flows are a concern. So how should the borrower decide? It comes down to a comfort factor with the monthly payment of the loan. Both have very similar down payments, and the interest rates are only .25% apart. 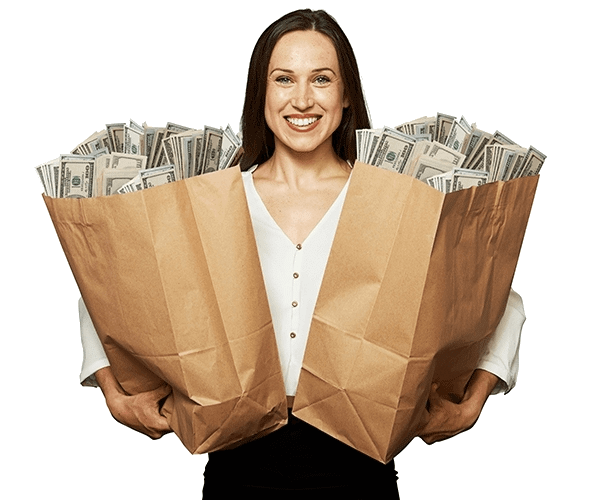 If the larger payment does not seem like a difficult burden, go ahead and get the lower rate. But the rate is only slightly lower, so most borrowers would be wise to protect themselves from future financial fluctuations that could occur. How About Full Qualification Before You Buy A Home? Whether you choose the 15 year mortgage or the 30 year fixed rate mortgage loan, a thorough analysis of your options should always be part of your successful home buying plan. 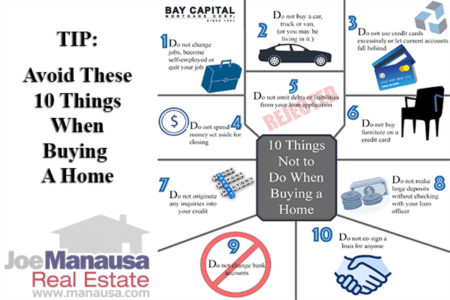 If you would like help determining your best course of action, with your loan as well as your home selection, just drop me a note and we'll be in touch right away.